A disappointing afternoon for Rovers as they fell to a 2-1 defeat to Scunthorpe United at the Mem. Inside 120 seconds, around 120 yards apart, so Rovers’ afternoon did turn. With the game at 1-1, and the Gas doing the pressing, Stefan Payne was fouled, giving Chris Lines the chance to score from the spot. Lines missed, denied by a superb save by Jak Alnwick, and within moments Scunthorpe had made the profligacy pay. Matthew Lund’s deflected winner was scruffy, in keeping with the manner of victory, but it was decisive. Earlier, controversy surrounded Scunthorpe’s opener, as Lee Novak eventually prodded home after most involved looked to an offside flag that never came. Rovers equalised on the stroke of half-time with a trademark Liam Sercombe belter, but the Rover of the Year’s stunner was not enough, despite the Gas seemingly having the ascendancy before the Irons pressed and, less-than-smoothly, nicked it. The two sides involved were separated by one point heading into the game, but their stories were far more contrasting than that one piece of nominal data. Rovers’ poor start has been offset by an improvement in form and results of late, while Scunthorpe, play-off semi-finalists last season, were probably not wholly disappointed with their early results. However, one point from their last six games saw them plunge to 19th before heading to the Mem. Goals, too, are a vastly differing proposition. 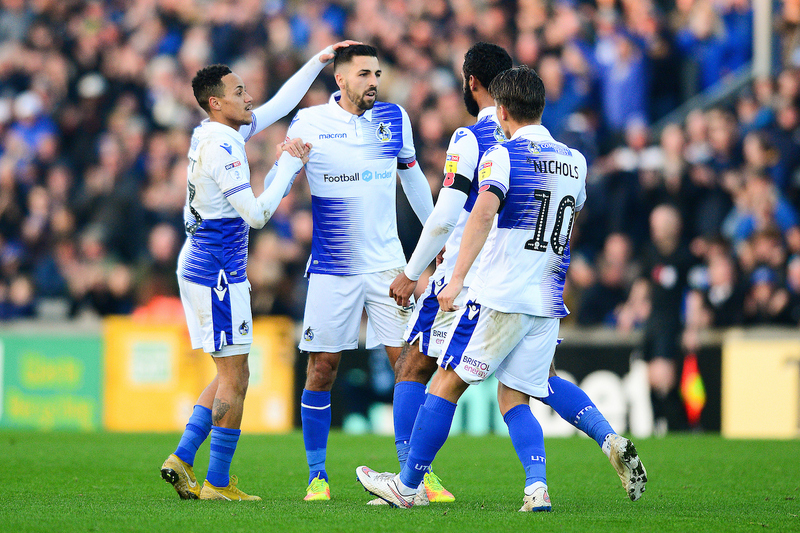 The Pirates tend to keep a tight ship, letting in just 14 goals from 17 games, a stat they share with league leaders Portsmouth. Only Sunderland, second, could boast fewer in that column, having played a game fewer, too. But while Pompey and Sunderland could boast 28 and 32 goals scored, Rovers had 14 in the ‘for’ column, too. Scunthorpe had been on the mark a healthy 26 times, but had shipped a remarkable 37 goals, six more than anyone else in the division. Scunthorpe certainly made their intentions known early on, confident attacking from the start and testing Jack Bonham when the experienced Lee Novak shot on target from twenty yards, only to find the Rovers stopper equal to the task. Rovers were soon creating chances of their own, though. Kyle Bennett was the man who finally got a shot away after a fair spell of possession, and though his on-target shot was not the most powerful ever seen, Jak Alnwick did not hold on to it, and Stefan Payne nearly profited, reaching the ball first, but seeing his shot deflected over the bar. 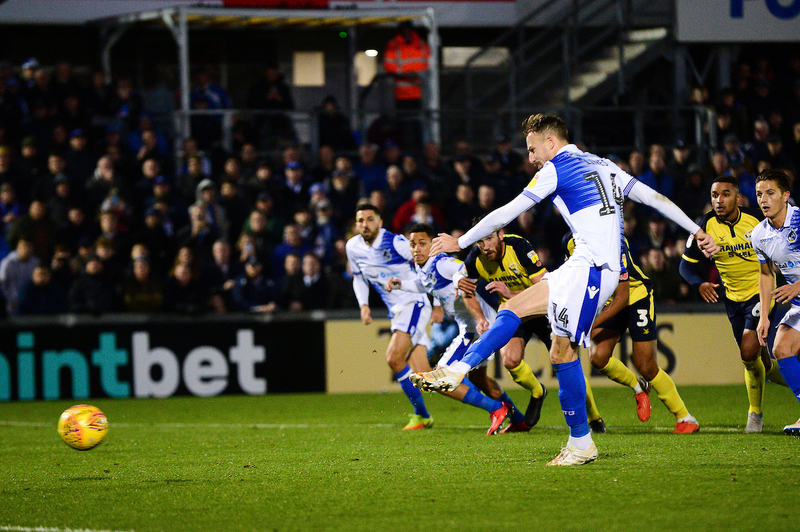 Rovers kept up the pressure for some time, forcing a series of corners, and from one that was unsatisfactorily cleared, it was worked back to Bennett. The Rovers winger took his time, beat a player, then curled a left-footed shot past Alnwick, but the ball frustratingly struck the crossbar. Before the quarter-hour mark Scunthorpe went ahead, in controversial circumstances. Ryan Colclough’s cross from the left was deflected into the air and reached Novak, who looked offside, as did Matthew Lund, who accompanied him. Between them, the Iron conjured the ball into the net, with Novak getting the final touch. Referee Lee Collins had a long chat with one of his assistants, presumably discussing the nature of the deflection, and the position of certain players at the time. Either way, the goal was given, and the Gas were behind, no matter what. Tom Nichols had a superb chance to level the scores when he was played in following a surging run by Liam Sercombe. Alnwick, though, spread himself well at Nichols’ feet. Nichols recovered to square to Bennett, but his first-time effort went agonisingly wide. Colclough had been Scunthorpe’s best player, but after a tricky run from the right flank cutting into the area, he collapsed in a heap, presumably having kicked the ground. He was replaced after several minutes of treatment to what looked like a knee injury. Sercombe went close again after twisting and turning like a twisty-turny thing then slamming a low drive on target, but Alnwick made a very fine save, low to his right, to deny the equaliser – but Sercombe could only be denied for so long. A lovely Rovers move saw Stefan Payne win a header in the right channel, with Nichols reading the runes and positioning himself for the flick-on perfectly. As Sercombe charged into the area on the left flank, he was the obvious outball, but Nichols still had plenty to do. In the end, he floated a sumptuous ball to Sercombe, who chested down to allow himself some space, then thumped home after one bounce. It was a while in coming, but Sercombe’s first goal of the season was in keeping with many of the midfielder’s previous fine strikes. Only 70 seconds after the break Ollie Clarke tried to emulate his midfield compadre’s effort, and stung Alnwick’s palms, as the Gas looked to convert their momentum from the end of the first half. Nichols then showed a combination of skill and persistence to get down the right flank and slalom into the box. His left-footed, powerful cross was a bit too hot for anyone following in, though. 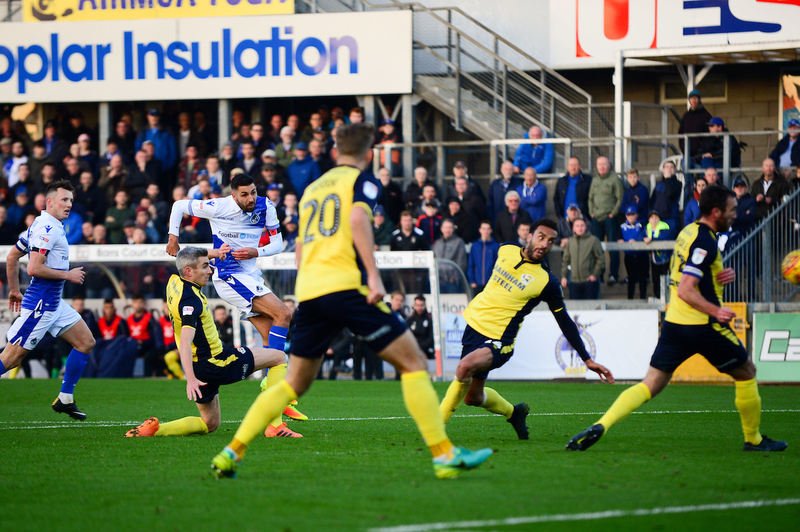 Scunthorpe forced a corner which seem to defy time and gravity as it spent an inordinate while in the air, and would not leave the six-yard area, but eventually Rovers smuggled it away. Most of the play tended to be done by those in blue and white, but final passes were sorely absent. In fact, from a rare foray forward, Andy Dales smashed a shot against the angle of post and bar, and Novak’s follow-up was cleared from the line by Ollie Clarke. Rovers had a golden opportunity to take the lead when Payne’s build-up play saw him exchange passes with Lines, head into the area, and get brought down. Chris Lines stepped up to take the spot-kick, and struck low and hard as he did successfully at Barnet seven days earlier. However, Alnwick read it, and stopped brilliantly diving away to his right. The punishment for the miss was severe. Scunthorpe’s first attack, moments later, saw former Gas player Lund get between defenders and shoot for him. The ball took a huge deflection off of James Clarke, and looped into the net in front of the jubilant 202 away fans. Hail Mary time. Darrell Clarke withdrew centre back Tony Craig and midfielder Ollie Clarke to throw on winger Alex Rodman and forward Alex Jakubiak. The resulting formation was not one for the coaching textbook, but a necessity in the situation. Rodman immediately drew a foul just outside the area, wide on the left, but Lines’ free-kick was too high and drifted out of play. Indeed, the game had drifted away. Rovers XI: 13 Jack Bonham(gk); 2 Daniel Leadbitter, 15 James Clarke, 5 Tony Craig (33 Alex Rodman, 84), 29 Joe Martin; 23 Kyle Bennett (26 Sam Matthews, 77), 14 Chris Lines, 8 Ollie Clarke (17 Alex Jakubiak 84), 7 Liam Sercombe; 9 Stefan Payne, 10 Tom Nichols. Subs (not used): 21 Adam Smith (gk), 6 Ed Upson, 22 Joe Partington, 27 Rollin Menayese. Booked: J Clarke 63, Nichols 69. Scunthorpe XI: 25 Jak Alnwick; 14 James Perch, 20 Charlie Goode, 23 Rory McArdle (capt), 3 Cameron Borthwick-Jackson; 49 Ryan Colclough (29 Kyle Wootton, 37) 7 Matthew Lund, 6 Funso Ojo, 12 Andy Dales; 17 Lee Novak; 9 Ike Ugbo (21 Cameron Burgess, 85). Subs (not used): 27 Jonathan Flatt (gk), 8 James Horsfield, 15 Clayton Lewis, 19 Yasin Ben El-Mhani, 33 Lewis Butroid. Booked: Borthwick-Jackson 38, Novak 60, Lund 75, Perch 86.